No, seriously, isn't life sometimes just the best? So, because I love a good backstory, this post requires a short introduction: I have a problem, one that largely entails talking to strangers. In January 2006, I was outside the Mod Club (this is why I specified that it was early 2006—I feel like the year is contextually necessary) when I noticed a girl standing in front of us in line, solo. I struck up a conversation with her, which in itself isn't notable. In fact, it would have been a completely unremarkable event if it wasn't for a fact that a month later, when Chloé, David Berry and I were in New York, she checked into our hostel. Fast forward to three weeks ago. My co-worker Lisha and I were at the Leslieville Tree Festival when one of the local circus schools started performing aerial silks on the tree next to our booth. Lisha was enthralled. "I wish I could try that," she said. 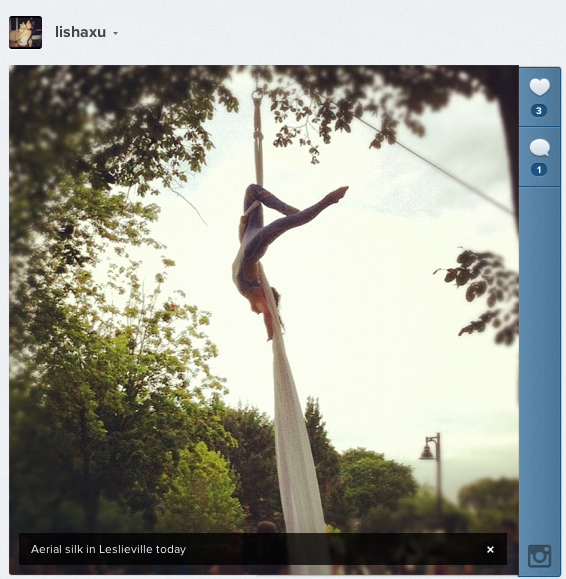 "I actually have a friend who teaches aerial silks," I told Lisha, thinking of Emily's school, Hercinia Arts Collective. "I should put you in touch with her." Two days later, Emily, somewhat out of the blue, messaged me on Facebook to see if I wanted to try a private lesson. Oh, and I could bring a friend. It also didn't hurt that this is the first activity of the year that genuinely fit in with Year of the Physical Fitness Challenge. (Let's face it; dogsledding and ice-fishing don't necessarily count as such.) And like all other activities in the year (that are yet to come, of course), I was completely terrified. On Tuesday, I met up with Emily and Lisha at the Hercinia studio in Liberty Village. First up, we tried silks. It was the perfect opportunity to demonstrate just how ungraceful and uncoordinated I am. Lisha, on the other hand, was immediately a pro. Next up was the hoop. Emily makes everything look easy, which is simultaneously terrifying and reassuring. At least I have decent balance. It's my saving grace. Finally, we moved on to the trapeze, which I thought was going to be my favourite. (When I was a kid, our log cabin down by the lake hanging from the roof. We used to spend our summers swinging from the dining table to the fireplace.) That is, until I remembered my fear of heights, hence the look of sheer terror on my face. Most terrifying two seconds of my life. If you want to try a class with Emily or any of the other instructors at Hercinia (which trust me, you probably do) they offer year-round private, semi-private and group classes, which are capped at four people. I love this! You are fit as a fiddle, and I love how magically this all came together. I'd love to try something like this!